Isolated conductors can also be charged statically as components. This is harmless to humans but harmful to circuits and components. That is why we sell ESD-safe products to prevent this static build-up. Weather conditions and materials all influence how much static discharge can occur. However, it quickly rises to kilovolts. Components often cannot handle this kind of discharge and so it is vital not to let the discharge build up too much. Damage caused by ESD cannot always be determined immediately. It is highly probable that the component will function fine at first and then fail inexplicably weeks later. Below you can see a picture of a damaged chip, showing how small-scale the damage often is. Because the damage often only becomes noticeable later on, it regularly happens that products suddenly fail after being in use for some time. In addition, making a diagnosis is often quite tricky. When a device is in use, all electrical connections are protected against ESD. For example, your mobile phone will not malfunction due to ESD. However, working on PCBs without housing, exposes the circuit boards to ESD at places that are not protected. When you’re unscrewing devices, you need to prevent that the electronics get exposed to ESD. When it comes down to these problems, prevention is always better. That is why we will discuss how to prevent components from malfunctioning due to ESD. The most commonly used method to prevent ESD is to dissipate the static charge as much as possible. Static electricity can occur on a balloon, but not on a metal plate connected to earth. The static electricity will be conducted through the plate to earth. However, a metal plate is not very practical in an electronics workshop. That is why special materials, often plastics, are used to dissipate the charge but not conduct it too much. 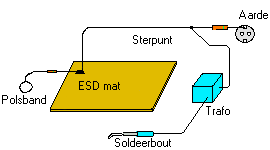 An ESD earth plug to connect everything to earth. An ESD work mat for an earthed work surface. An ESD wristbandto earth yourself. ESD safe tools so that sparks are not shot off. Remove all static rechargeable materials from the workplace. Only use equipment that is earthed as well. When soldering a component, the PCB must be in direct contact with the work mat. When mounting a PCB, always attach coils, resistors and capacitors to the PCB first and then afterwards the ESD-sensitive components such as FETs and ICs. Always use an earthed power outlet. Keep isolators as far away from fragile components as possible, as charges can remain in an isolator for a very long time. Storing also involves ESD safety, e.g. components cannot be stored in any packaging, as friction with some materials can cause static discharge. ESD safe plastic bags used to transport computer components are an excellent example of suitable packaging. For home use, however, things like trays are more convenient. And so it seems that an everyday phenomenon that everyone knows, actually has more consequences than the few sparks you get when taking off a sweater. So should everyone work ESD safe then? If you want reliable electronics, then yes, you will need to work ESD safe. We even sell ESD-safe vacuum cleaners for professional laboratories, so you can go as far with this as you’d like.